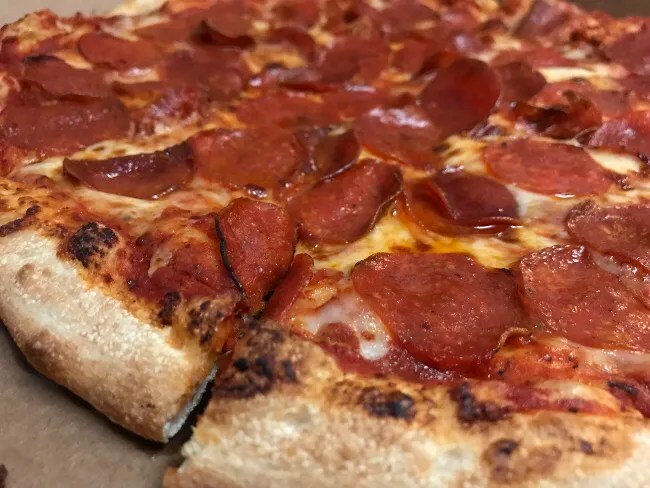 Everyone knows Friday night is pizza night, right? I mean, that’s a universal thing…right? Last Friday I was stuck in Lansing pretty late for work. J went ahead and got pizza for her and the kids from Cottage Inn on KL Avenue like we do quite often. I wanted to take advantage of being away from home to find a new pizza place. Every little town has it’s own pizza place so I had a lot to choose from between East Lansing and Kalamazoo. I looked at places in Charlotte and Marshall because they were the bigger towns and closest to the highway on the way home. Both had something that would work but I chose the Marshall one since I’d be a little closer to home by then. 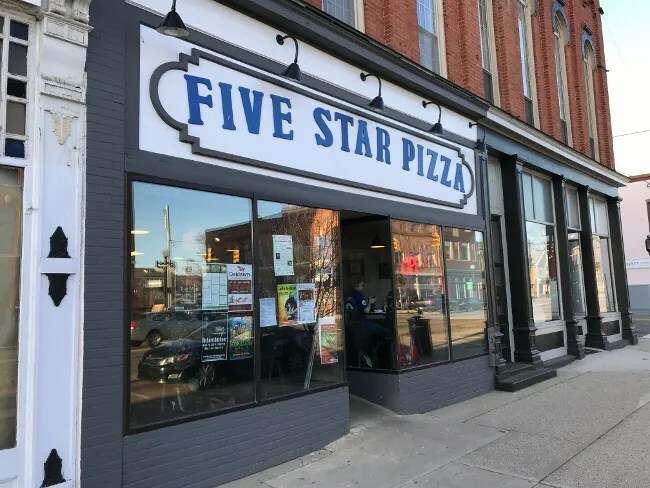 Five Star Pizza is in downtown Marshall on Michigan Avenue just west of Jefferson Street. It looks like the building may have been a Schlotsky’s at one point before it became home to this local pizza chain. 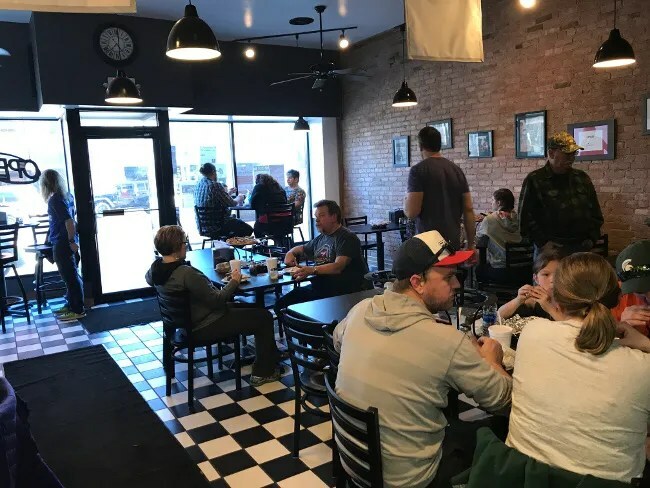 The Marshall location is one of six for the pizzeria. The others are in Colon, Bronson, Union City, Coldwater, and Homer. This location in the heart of Marshall opened late last year in the beginning of December. The restaurant is a great classic pizzeria. There is an order counter in the back that looks into the kitchen where organized chaos appeared to be the them on this busy Friday nights. Pizza peels were flying around and pizzas were being slid into boxes as fast at they could be folded. There is a large dining room which was almost full. Tables are crammed into a space that pops with a black and white checkerboard floor and exposed brick walls. The space is dimly lit by hanging lights from the finished ceiling. I put the restaurant in my GPS from East Lansing so I knew when I would be about 25 minutes. When I hit that point, I called in my order for a large pepperoni pizza. It was ready when I got to the shop. They take both cash and credit (I hear that’s a new development). I had stopped to get cash on my way because I thought they were cash only so I just stuck with that. The total came out to $13.15. It was hard waiting until I got home to open the box but I put it down on my seat the wrong way. I couldn’t easily open the box while driving so I had to wait. The pizza was a pretty typical local pizzeria type. The crust was fairly thin but not a thin and crispy. Nor was it a thick, doughy crust you get from the chain delivery places. It was crispy towards the middle and got chewier as you got towards the outer rim. An extra cup of marinara or some garlic butter would have been amazing with this dough. The pepperoni’s were piled on and almost overlapping each other. The sauce was put on pretty thick and it was a sweet sauce that soaked up the grease from the pepperoni’s and cheese. 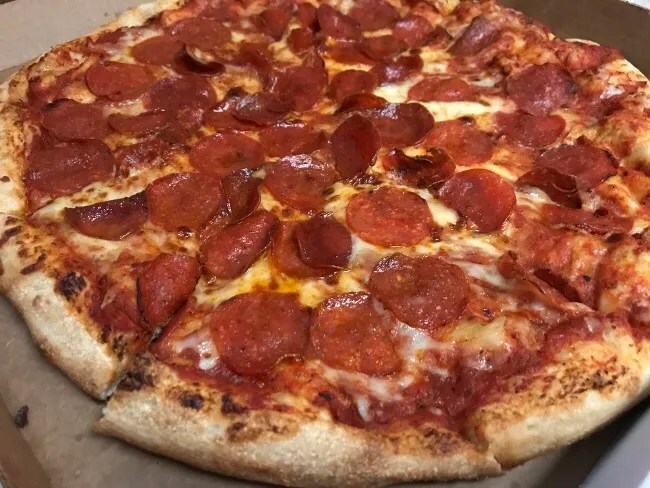 Many of the pepperoni’s had that great crispy edge from being too close to the top of the pizza oven which makes them even more delicious. 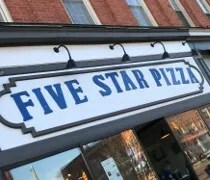 Five Star Pizza is a great local option for pizza in Marshall. It’s no surprise they have five shops in the region. The pizza is the kind of take out you do every Friday night when you live there. For me, just passing through, this was a great alternative to the big chain pizza places and so much better than the cold, leftover pizza my family had waiting for me at home. Next time, ask for garlic & parmesan on the crust! Five Star is the best! Best pizza this side of Colon. Tried their pizza on Sunday. Flavor was good, but crust was soggy. I as disappointed.